NASA's Cassini spacecraft is on its farewell journey as it is being pulled into Saturn's atmosphere after 20 years in service. Cassini will be transmitting information until being vaporized and torn apart by the giant gas planet's gravity. It's been just under 20 years since NASA's Cassini spacecraft left Earth for its mission to Saturn - but in just a few days, it will undertake its Grand Finale, intentionally plummeting into Saturn's atmosphere to be pressurized into oblivion. NASA’s Cassini spacecraft has beamed back images from Saturn’s southern hemisphere, showing off the ringed planet’s stunning atmospheric aurorae. NASA's Cassini spacecraft captured a sunrise on Saturn, the moment the sun's rays just started to illuminate the rings of the giant planet and its clouds, according to NASA's official website. As NASA’s Cassini probe continues its final mission, the Grand Finale, the spacecraft managed to obtain unique images of Saturn’s unusual moon Iapetus. NASA's Cassini spacecraft made new pictures of Saturn and the famous storm at its north pole on the second day of the planet's solstice, NASA reported. The Cassini probe unexpectedly found no trace of dust between the rings and the atmosphere of Saturn, through which it flew for the first time a week ago, at the end of April this year, NASA reports. According to space agency, NASA's Cassini spacecraft has for the first time passed between the upper layer of Saturn's atmosphere and the planet's rings. After spending nearly two decades in space, the NASA’s Cassini spacecraft is about to begin the final stage of its long journey. NASA's Cassini spacecraft has photographed Saturn's moon Pan in amazing detail, which reveals the satellite has an unusual shape reminiscent of a dumpling. A NASA spacecraft managed to obtain what's thought to be one of the most high quality images of Saturn’s moon Pandora to date. Cassini, NASA’s Saturn-orbiting spacecraft, has begun an unprecedented mission to skim the gas giant’s rings before making a triumphant suicide dive in late 2017. Cassini spacecraft is set to start its farewell mission at the end of November. Back in 1997 NASA’s Cassini spacecraft and its attached Huygens probe launched from Cape Canaveral to arrive in the Saturn system seven years later. Last month, astronomers announced that a ninth planet may lurk in the dark, far beyond Neptune. The problem? They have no idea where it is. Thanks to the Cassini spacecraft, however, scientists have narrowed their search. 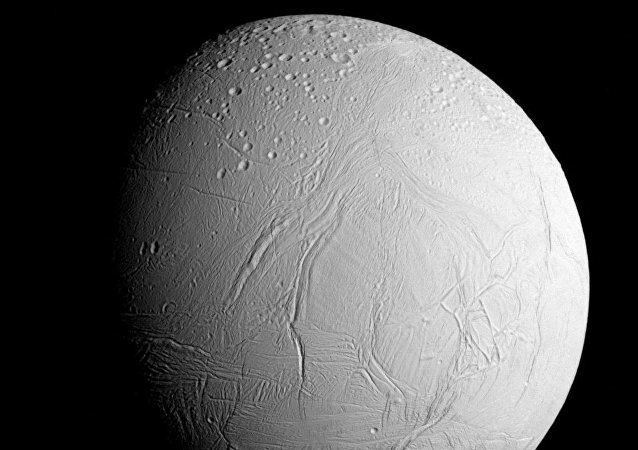 Saturn's ice-covered ocean moon, Enceladus, may be able to support alien lifeforms under its ice volcanoes, according to new data released by NASA.